Book a window seat if you're flying into these airports! Aisle or window? That’s a question I’m sure many of us are familiar with. I’m a big fan of window seats – you’ll know why if you’ve seen any of my Plane Views posts! Whether you’re an aisle or a window person, here are ten airports you’ll want to book a window seat for (arriving, departing or both)… in all cases because of the amazing views but I’ve included two airports for those among us who love the occasional adrenaline rush! Australia’s biggest and busiest airport is also one of the best to fly into. Sydney Kingsford Smith has two parallel runways in a north-south alignment. If you’re landing from a northerly direction or taking off in a northerly direction from these runways, you’ll be treated to amazing views of Sydney Harbour, arguably, one of the most beautiful natural harbours in the world. Aerial view of Sydney after take-off from Kingsford Smith. 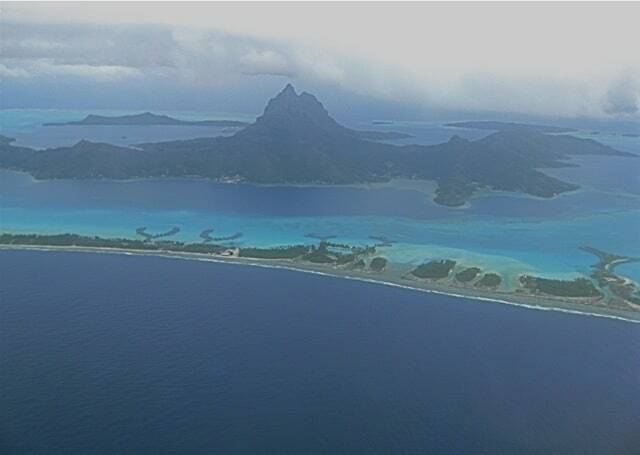 Little more than an airstrip on the outer fringe of the Bora Bora lagoon, BOB boasts one of the most jaw-dropping views anywhere around so make sure you book yourself a window seat flying in and out! An unforgettable view of Bora Bora after take-off. 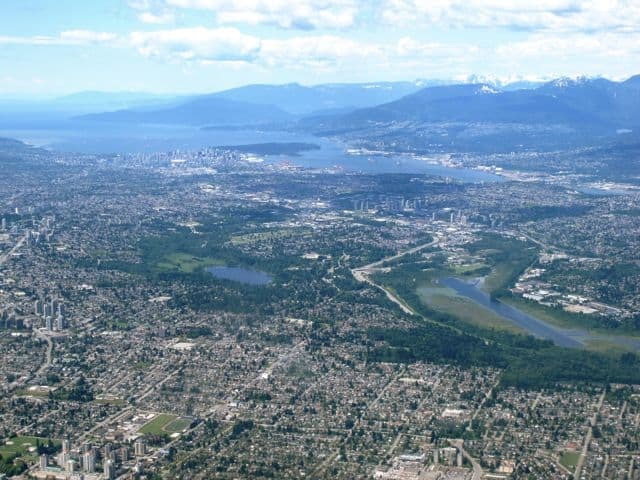 If you’re lucky and the weather is clear, YVR offers flyers stunning panoramic views of the Coastal mountains, the Vancouver skyline and the ocean. Look out for the snow-capped Mount Baker! 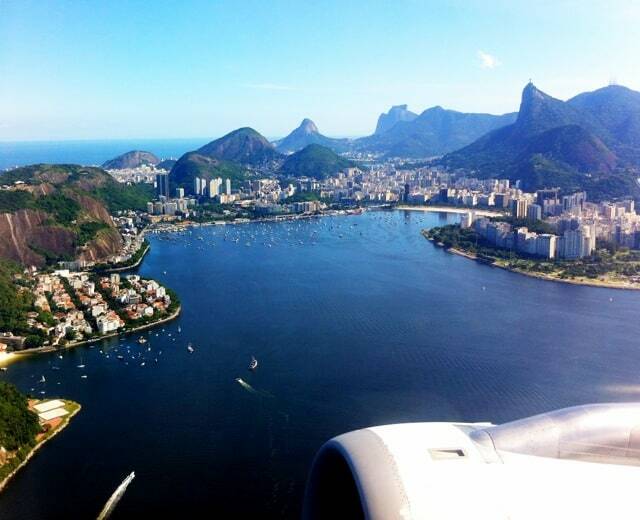 Rio de Janeiro‘s domestic airport a stone’s throw from the city centre offers breathtaking views of the city during any take-off and landing. This is one airport you definitely want to have a window seat for! Juneau, the capital of Alaska, has one of the coolest airports I’ve ever flown into. Approaching from the south, the plane flies low inside a fiord, with steep forest-clad mountains on both sides, before making a sharp bank to the left and landing. As the plane lines up for the final approach, you’ll have terrific views of the amazing glacier in the airport’s backyard! 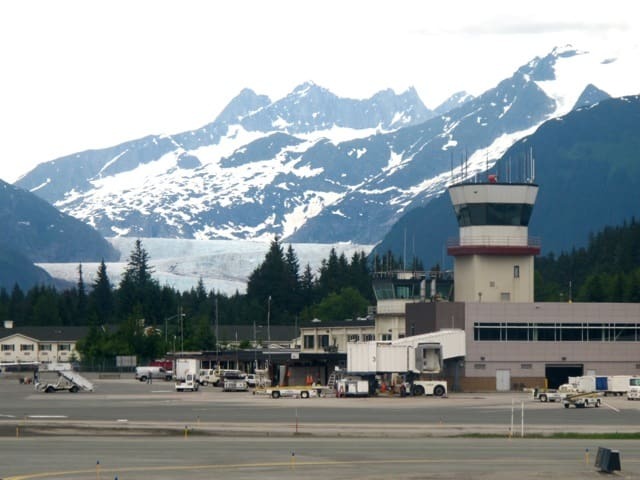 The airport in Juneau with the glacier as a backdrop! Congonhas is arguably one of the most notorious airports in the world. It reminds me of Hong Kong’s old Kai Tak airport which required planes to fly in low over the rooftops of buildings on the approach – a true nail-biting landing! 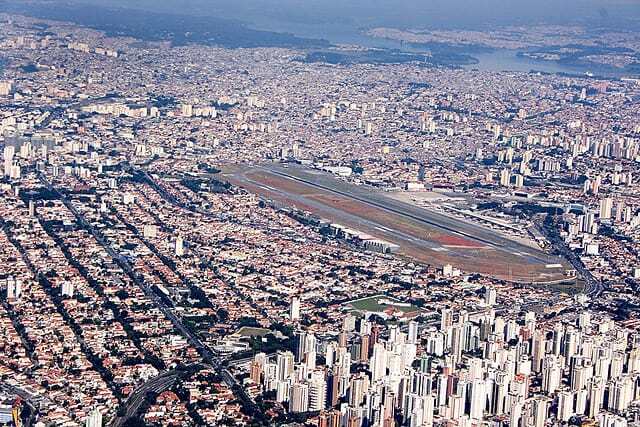 Located smack in the middle of one of the world’s largest cities, Congonhas airport is surrounded by a sea of skyscrapers and a web of highways and roads. It also has two relatively short runways with a steep drop-off on both ends. Paulistas love this airport because of its central location. A window seat is a must, especially for the thrill-seekers among us! The old Hong Kong airport at Kai Tak offered one of the most nail-biting landings anywhere around. Since the opening of the Hong Kong International Airport on Chek Lap Kok island in 1998, landing and taking off in this Asian city is a lot more pleasant. On a clear day, landing at or taking off from HKG can also be a beautiful experience, with fabulous vistas of the Hong Kong skyline, Victoria Harbour and the surrounding islands. Dubai’s ambitious projects are best seen from the air, like the skyscrapers of downtown Dubai (including Burj Khalifa, the world’s tallest building), the Palm Jumeira and Palm Jebel Ali islands and ‘The World’ archipelago. Book a window seat for spectacular views of the city and its amazing structures. 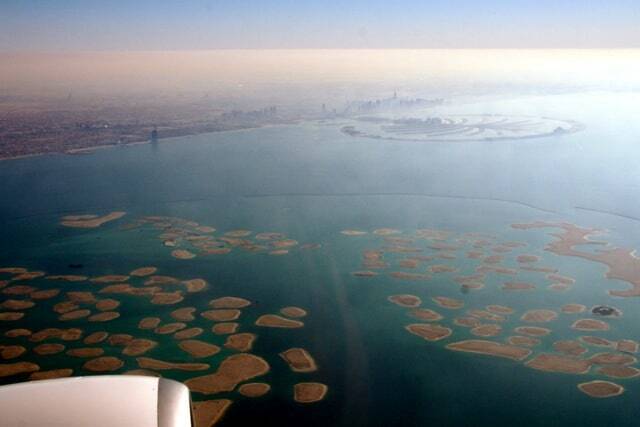 Views of Dubai’s ‘The World’ and Palm islands on take-off from DXB (image courtesy of Nico Crisafulli). Of all the airports serving the greater New York City area, Newark in New Jersey offers perhaps the best views of the Manhattan skyline as its runways are aligned parallel with Manhattan island. You’re in for an unforgettable treat if your flight lands from a northerly direction during sunset on a clear day – the golden colours of the sunset reflecting off the skyscrapers on Manhattan are truly a sight to behold! If you’re flying into JFK or La Guardia, book a window seat anyway! View of the Manhattan skyline during a landing at Newark (image courtesy of Blueridge Kitties). This tiny island in the Eastern Caribbean just south of Sint Maarten is a favourite diving spot for those in the know. The island of Saba is basically the peak of a volcano jutting out from the sea, with steep forested slopes on all sides and the island’s four villages located on the upper reaches of the volcano. 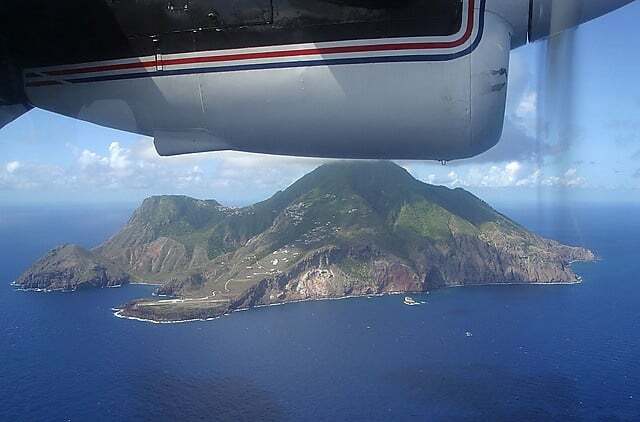 Saba island (image courtesy of Avalonn). 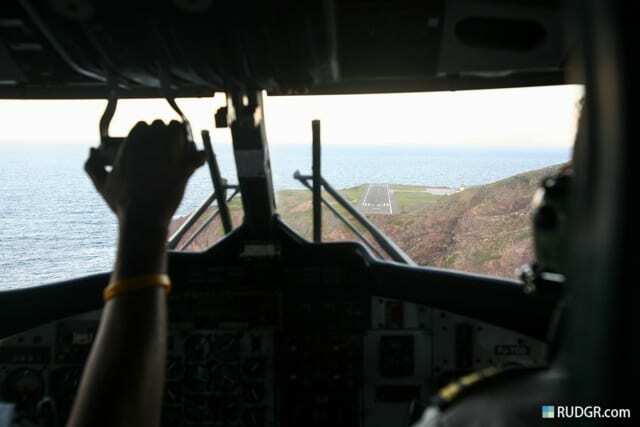 Getting to Saba is an adventure in itself as the island’s airport boasts the world’s shortest commercial flight runway, at just about 400 meters! In addition, the runway is flanked by steep mountain slopes on one side and cliffs on the other! This is another airport for the thrill-seekers! Do you know any other airports which offer amazing views during the approach or take-off? Please drop a note in the comments section below. I know you do! 😉 Thanks Frank! Great photos Keith! As you know, I always love those shots from plane windows! Yep, I’ve experienced that many times before too – sitting on the wrong side! Haha! And sometimes, I get lucky! Hi Keith, from this list I’ve only flown to Newark, and despite having a window seat, i was unlucky enough to be seated on the wrong side. So i guess there are 2 considerations to make: be lucky enough to sit on the right side and avoid a night flight to benefit from the spectacular views!!! We recently flew into Orly Airport sitting on the left side and seeing the Eiffel Tower was pretty cool on the approach and landing. Also, Seattle and Mt Rainier views are stunning. I was going to say it would be great to see a tiny little nothing runway that’s barely long enough to stop in time, but there it was at the end. I love flying into San Diego, especially at night since you get the feeling of flying through the skyscrapers and landing by the ocean. It saddens me that when you land at Cdg in Paris you don’t get to see the city , only when landing in Orly. Definitely Funchal airport on Madeira…breathtaking, and a little bit scary! Great tip Angela! I’ve flown into Seattle several times and the views are pretty awesome on a clear day! Thanks! One of the posts in my Plane Views series features a flight from Vancouver to Portland OR. Livingstone, Zambia! On the left side is usually best for views of Victoria Falls, but you may catch it on both sides! What about Seattle? All the snow-capped volcanoes on a clear day is a must! I would like to add to the list the Madeira Island Airport, in Portugal. Its amazing!! I was glad to see Hong Kong on your list! I used to fly to HK frequently and would also always try to book a seat on the right side for landing and the left side of the plane for taking off (I hope I’m remembering that right and not backwards) in order to spot the big Buddha! I would definitely add in a “vote” for Geneva, especially on arrival. Make sure to have a window seat on the left side of the plane. Too bad I don’t have a pic, always to busy being mesmerized! Sao Paulo definitely had one of the most gorgeous views I’ve ever seen from an airplane window. The fact that it is such a gigantic city is mind-blowing. My hometown Geneva, Switzerland, also has a great view when landing at the airport. You get to see the gorgeous lake and the snow-capped Alps upon arrival. It always puts a smile on my face coming back home; I’m lucky to live in such a beautiful city. These are great! I’ve visited Saba and even the airport, but didn’t fly to the island. We took the ferry from Sint Martin. Paro Airport in Bhutan is spectacularly set among the Himalayas. My absolute favorite airport was the Tribhuvan International Airport in Kathmandu, Nepal. Sit on the left on the flight from Delhi. If it’s foggy, you’ll view precarious farms, cute homes, and mountainous villages. If it’s clear, you’ll see magnificent snowy peaks peeking above the clouds. I couldn’t tear my eyes away! Funchal Madeira island is very interesting. I second Queenstown, NZ – one of my favourites! But Sydney ALWAYS makes me smile. I was at TBEX – sorry we missed each other. BTW, I really appreciated the article, Keith, and especially the myriad responses. I’ve spent the morning googling these airports and have had an enjoyable time of it. Thanks everyone! Sorry we didn’t get to meet in Canada when I was at #TBEX and you were in Quebec I believe. 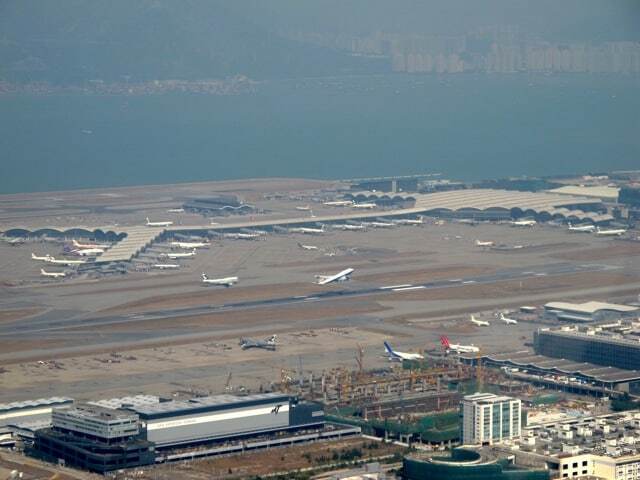 You mentioned the old Kai Tak airport at Hong Kong. I was a buyer at Six Flags for several years and would always sweat this landing. It literally was a nail biter for me and would scare me to death everytime we landed. Hong Kong itself on the other han,d was one of my favorite stops! Safe Travel y Saludos! Thanks Mo! It looks beautiful! They say it’s the shortest in the world, along with the runway at Lukla in the Himalayas. Crazy! Thanks for the tip. Whoa, Lukla is definitely for the thrill-seekers! Looks like the spot where the opening scene of one of the James Bond movies (Goldeneye?) was filmed. Thanks Kevin. Many people have mentioned CPT. I’ve flown in quite a few times but to/from Europe, I’ve only landed/departed at night. 🙁 That said, the first time I visited CPT, the plane approached the airport from the south and the view of the floodlit Table Mountain was incredible. I’ll never forget that sight! Yup, Singapore is a decent candidate – flown in many times. However, if I were to pick one airport in the region, I would pick Phuket, especially if you’re flying in from Bangkok. The views of the strange, dragon-like limestone formations both on land and in the sea are so surreal, then some gorgeous beaches. From the south, you’ll fly past the beautiful islands of Koh Phi Phi. Christmas Island. Indian Ocean off NW Australia. SFO taking off toward the Pacific in a 747 you barely graze Mt. San Bruno, then the view of the G G bridge, especially if the fog is in and just the towers are showing. Landing, coming in from the north, going almost the length of the Bay with the speed brakes deployed for a quick descent, then a 180 for a nice glide up the Bay, watching both the Peninsula on the left and the East Bay on the right, inches above the whitecaps, then *Boom* the wheels touch down. Priceless! In New Zealand Queenstown airport is terrific with mountains and lakes alongside the window. In Nepal sit on the left hand side of the plane to keep an eye on Mt Everest as you fly into Lukla. Exciting. In Fiji the flight into Taveuni Island is spectacular. Two that I love: my native San Francisco – the flight path comes in directly over the city giving superb views of the Golden Gate Bridge, Golden Gate Park, downtown, et al. Makes flying home so welcoming. Flying into London’s pretty great as well, showing everyone on the right side of the plane all the downtown sights. And I agree with Russ that Cuzco is amazing, the way they bank over the mountains on the final approach is hair raising! Of course, approach into Cape Town is spectacular! Kushok Bakula Rimpoche airport. Leh. Ladakh. India – the flight from Delhi crosses the lower Himalayas, banks and lands at the airstrip in the Leh valley sandwiched between the Karakoram and Ladakh mountain ranges. Montreal is also a great place to book a window seat, especially on the left-hand side of the plane. It’s nice to see the Olympic Tower, the skyscrapers of downtown and the hundreds of perfectly square-shaped city blocks. Love it! Marco Polo Airport – Venice. See that islands making Venice really DO look like a fish! Labuanbajo (Flores Island, Indonesia) is a must for both the thrill and the beautiful scenery. Innsbruck is a great one as the approach is a very steep dive at the last minute due to mountains that surround it! Thanks Russ! Yup, good ones. I actually have a post about the flight from Santiago to Punta Arenas: https://velvetescape.com/2009/05/plane-views-santiago-to-punta-arenas/ Awesome flight! Las Vegas by night ! Incredible ! May I humbly submit Paro International Airport, Bhutan?